“Between Land and Sea” featuring a panelists of local West Coast surfboard shapers, surfboards and Art! Welcome to our collaboration event of Nautilus Art Centre, SALT Festival and Mana Wellbeing Centre. Let’s begin at 3pm Sunday 22nd meeting at the foreshore by Makybe Diva with your favourite surfboard and share in a community surfboard quiver snapshot and some salty yarns! and the collaboration of surfboards shaped by our own local West Coast shapers. From 4pm the main event begins! We will also features a Geoff White video. Ngahuia Trewartha will be asking questions about shaping boards, surfing, fishing and living on this beautiful coastline of Eyre Peninsula. 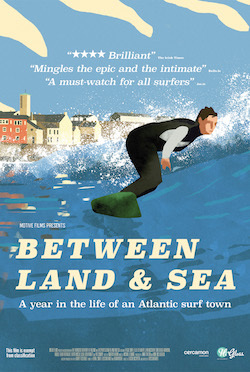 Between Land and Sea, is a stunning new documentary by Ross Whitaker (Saviours, Unbreakable) who spends a year in Lahinch, a small town on Ireland’s west coast and the unlikely home of one of Europe’s best big-wave breaks.